The company has had a volatile existence in recent years, but the worst may not be over. The nation's leading provider of natural gas fuel for transportation has a lot going for it on paper. Natural gas is much cheaper than gasoline and diesel, can be sourced domestically, and is cleaner burning, to boot. While that's good for investor story time, it hasn't translated into much value for shareholders of Clean Energy Fuels (NASDAQ:CLNE). The stock continues to slide lower and is now threatening the all-time low of $2.15 per share. 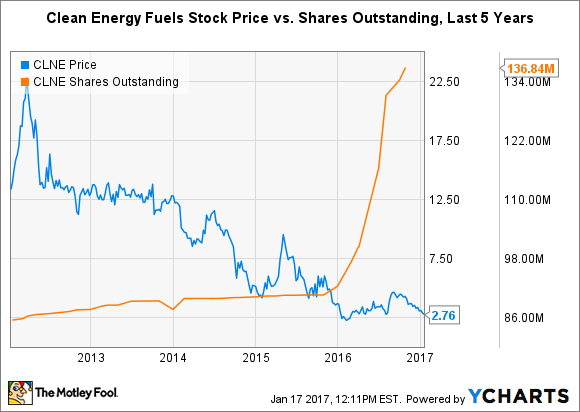 Investors hoping for a swift rebound may want to consider these three reasons Clean Energy Fuels stock could fall further still. Despite the advantages of natural gas fuels over petroleum-derived fuels, the latter have a clear advantage where it really counts: infrastructure. The number of retail gasoline stations vastly outnumbers places to fill up on compressed natural gas (CNG) or liquefied natural gas (LNG). That's hardly surprising. Unfortunately, the promise of natural gas fuels is quickly fading as automakers and local and state governments pour investments into other alternative fuel technologies. The U.S. Department of Energy currently lists just 936 natural gas fueling stations in the Lower 48, while the number of recharging stations for electric vehicles has grown exponentially in recent years. To be fair, Clean Energy Fuels has wisely focused on commercial and industrial fleets, which can more fully leverage the advantages of natural gas fuels, including the ability to be centrally fueled and longer driving ranges compared to gasoline and diesel. It has also doubled down on building CNG and LNG stations in strategic locations to provide better access for commercial customers. The company now owns a network of over 550 public and private refueling stations. Still, the trend in alternative vehicle technology doesn't appear too kind to the company's future. Image source: U.S. Department of Energy. A lack of fueling stations has kept Motor City from offering many light-duty consumer vehicle models capable of running on any form of natural gas transportation fuel. Although there is plenty of growth available, even commercial and municipal fleets are increasingly turning to other alternative fuel vehicles over natural gas-powered models. Without a quick change of fortune, natural gas vehicles and trucks could be left in the dust by electric technologies approaching on the horizon. Natural gas fuels are much cheaper than gasoline or diesel fuel on an energy-equivalent basis just about everywhere in the United States, which should remain the case for the foreseeable future. That's one of the best selling points of CNG vehicles to fleet owners and consumers. However, the price spread between natural gas and gasoline has been tightening since last summer, which could spell trouble for Clean Energy Fuels in the near future. Data compiled from EIA.gov. Chart generated by author. Why? Natural gas prices determine the company's input costs, while gasoline prices help establish acceptable selling prices for CNG fuels. If natural gas prices rise or fall in lock-step with gasoline prices, then it shouldn't impact margins. If natural gas prices fall while gasoline prices rise, then it should result in a favorable pricing spread for the company since input costs are lower and selling prices are higher. If natural gas prices rise faster than gasoline prices, then it could have the opposite effect -- smaller margins due to higher input costs and lower selling prices. Unfortunately, the tightening price spread threatens shareholders with the latter. Investors will be able to test this hypothesis during the next two quarterly earnings announcements if the trend holds for a significant portion of upcoming financial periods. Management made a bold move in July 2016 to pay down a significant portion of its debt with cash on hand and cash generated from a share offering. When combined with other balance sheet-boosting decisions, the company's debt-to-assets ratio fell from over 50% in the third quarter of 2015 to 39% in the third quarter of last year. That's good news. The bad news is the number of shares outstanding is ballooning. Clean Energy Fuels has seen its share price decrease as a result of significant dilution in the last five years. Couple that with a dwindling cash pile and potentially worsening margins on fuel sales thanks to increased natural gas prices, and investors could be in store for even more dilution in the near future. Management will continue to cut capital expenditures to extend its funding runway, but that can only be done for so long. Clean Energy Fuels is a great example of a company that has solid technology and a great story, but fails to deliver in the real world. It has certainly managed to grow sales and expand the use of natural gas fuels in the country in the last decade, but it has an abysmal track record of creating any shareholder value (because it hasn't created any). The stock price is low now. However, the three reasons listed above could mean Clean Energy Fuels stock will fall even further, perhaps for the long term.